Closest matchup: Castlevania: Aria of Sorrow snuck by Tales of Symphonia by a single vote thanks to ploot's last second difference maker. 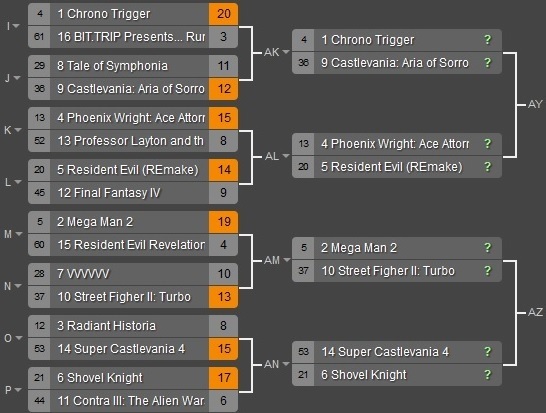 Biggest Blowout: Chrono Trigger lived up to its number one seed, with the classic game blowing by one of the newer games in the field in Runner 2. Biggest Upset Super Castlevania 4 is not universally beloved, but it took down the higher ranked but more obscure Radiant Historia without much difficulty. Many V's lost their lives on that day. Ploot, you're cruisin' for a bruisin'! Have you tried Aria of Sorrow? It's available on Wii U.
lol. Take me with you.